Usually considered as the 'best' melee weapon because of its ability to take out most targets with one blow to the head, the Salvaged Sword is a cheap and durable weapon that most keep as a backup plan in the event of a fight turning to close quarters. A fairly cheap melee weapon that is arguably the best melee weapon for fighting because of its short attack delay, fast attack rate, and high damage, especially with headshots. Being able to do enough damage to down a person with most helmets with two headshots. 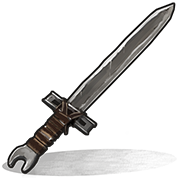 The salvaged sword is also the fastest and cheapest melee weapon at destroying deployables and the hard/soft side of wooden walls.